Out with the old, in with the new….helmet, that is. Six days ago, I took a hard fall when skiing. It wasn’t on a black diamond or even a difficult blue slope; the slope’s own name, Kruser, testifies to the reality that it’s a pretty easy run with a few sharp drops that are more fun than anything else. Nonetheless, I caught an edge, weighted my downhill ski wrong, and flipped to land hard on my back and shoulder. During the tuck and roll, my head hit hard on the packed powder snow. That was the helmet on my head during that fall…and that crack, right where you see the harness in the full picture, was the result. I had a wee bit of whiplash from that fall, but I suspect that without the helmet, things could have been much worse. 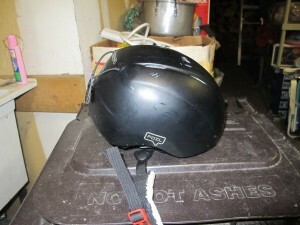 And, per all helmet advisories, that helmet has served its time and is now in the trash. It’s been replaced. And am I a helmet advocate? Oh hell yes. The only time you’ll find me on horseback without a helmet is during a Western show. On skis or on a bicycle…never. Helmet. Always. Didn’t need this to make me a believer, though. 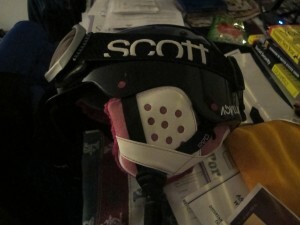 Comments Off on Out with the old, in with the new….helmet, that is.